This is a public Working Draft for review by W3C members and other interested parties. This document is a product of the XML Processing Model Working Group which is part of the W3C XML Activity. The English version of this specification is the only normative version. However, for translations of this document, see http://www.w3.org/2003/03/Translations/byTechnology?technology=xproc. This is a Last Call Working Draft for review by W3C members and other interested parties. It contains one significant addition to previous drafts: a discussion of validation, as well as extensive editorial changes made in response to reviewers comments on our previous draft. Once again it is the Working Group's intention, since this specification does not require new implementations, as many existing XML processors implement one or more of the profiles defined below, that no Candidate Recommendation version will be published, and that the next step for this specification will be to Proposed Recommendation—interested parties please take note and comment accordingly. The effective deadline for comments is 29 February 2012. Please send comments on this draft to the public mailing list public-xml-processing-model-comments@w3.org (public archives are available). As this specification is intended for use by other specifications which themselves define one or more XML languages, the Working Group particularly welcomes input for other Working Groups who are responsible for such specifications. Few specifications are implemented in their entirety, in exactly the same way, by every implementor. Many specifications contain optional features or areas of acknowledged variation and some implementors choose to ignore required features that aren't needed by the community they serve, chosing to trade conformance for other benefits. In the case of XML, there are exists not only optionality in the XML Recommendation itself, but there are a whole family of additional specifications which an implementor may choose to support or ignore. In principle, there are an enormous number of possible variations. In practice, there are dependencies between the specifications that limit the number of possible variations and implementors aren't motivated to implement completely arbitrary selections. The Infoset gave the community a vocabulary for discussing the items produced by a parser. This specification gives the community a vocabulary for describing common sets of higher level features by describing profiles, collecting specific sets of features drawn from the family of specifications, and providing names for them. One goal of this work is to help establish a lower bound on the number and nature of features supported. The ability to communicate by sending XML documents back and forth is predicated on the notion that we have the same understanding of those documents. While we might wish for the richest possible understanding, that's not likely to be supported by the widest range of implementations. Establishing a few basic profiles, we hope, provides a foundation on which other specifications can build. The XML specification [Extensible Markup Language (XML) 1.0 (Fifth Edition)] defines an XML processor as "a software module. . .used to read XML documents and provide access to their content and structure. . .on behalf of another module, called the application." XML applications are often created by building on top of the [XML Information Set] vocabulary or XML data models such as [XML Path Language (XPath) Version 1.0] or [XQuery 1.0 and XPath 2.0 Data Model (XDM)], understood as the output of an XML processor. Such definitions have suffered to some extent from an uncertainty inherent in using that kind of foundation, in that the kind of processing which XML processors carry out on XML documents, as well as the amount of information they provide to applications as a result, is flexible to a certain extent. Some of this flexibility stems from the XML specification itself, which is not always explicit about what information must be passed from processor to application, and which also leaves open the possiblity of reading and interpreting external entities, or not. Another kind of flexibility has arisen from the growth of the XML family of specifications: if the input document includes uses of XInclude, for instance. This specification addresses this issue by defining several XML processor profiles, each of which defines how any given XML document should be processed, both operationally and in terms of what information must be made available to applications. It is intended as a resource for other specifications, which can by a single normative reference establish precisely what input processing they require as well as what information they require. The profiles presented here are designed for use with respect to static outcomes, that is, to the result of XML processing as (if) produced by a batch process. They do not attempt to address the question of the preservation or lack thereof of information itself, or of information invariants, in the course of incremental construction or in the face of piecemeal modification. The profiles defined here are appropriate for processing both XML 1.0 [Extensible Markup Language (XML) 1.0 (Fifth Edition)] and XML 1.1 [Extensible Markup Language (XML) 1.1 (Second Edition)] documents. References to XML or XML Namespaces below should be understood as references to 1.0 or 1.1 as required by the relevant document or application. The term base URI is used in this specification as it is defined in [RFC 3986]. The profile definitions which follow all assume that the starting point is a well-formed and namespace well-formed XML document. This specification does not consider documents that are not namespace well-formed. Documents which are not well-formed are not XML. Each profile is defined in terms of conformance requirements on processors with respect to various XML-family specifications, and in terms of requirements on the information they provide to applications. Information provision requirements are specified by reference to classes of information items and properties, as further defined in 3 Classes of Information. It is the information itself which is required, not the particular packaging of it implied by the items and properties used to define those information classes. Processors typically package information in terms of more-or-less standardized data models or application program interfaces (APIs). How the information required for conformance to a particular profile defined below is conveyed by a data model or API need not correspond point-for-point to the Infoset terminology. For example, a data model may expose element content as an array of strings. That does not prevent it from conforming to the requirements expressed below in terms of the [XML Information Set]'s Character Information Items, for example requirement (3) of 2.1 The basic XML processor profile. The Full profile adds xi:include processing, in order to transclude linked infosets as parsed XML or as text, recursively as required. The precise nature of each of these profiles is described in the sections which follow. Accurately provide to the application the information in the document corresponding to information items and properties in classes Core, Signal, Decl and ImplDef. Accurately provide to the application the information in the document corresponding to information items and properties in classes Core, Extended and ImplDef. Recognizes and reports the ID type of all xml:id attributes in conformance with [xml:id Version 1.0]. For the profile definitions above and the invariants below, we categorize the information expressed in XML documents, which may be made available to applications, into a number of (overlapping) classes. What follows is a complete tabulation of all the information items and their properties from [XML Information Set], annotated with one or more class labels. Items and properties which are fundamental for all XML applications and so must be provided by all profiles. Items and properties which depend on declarations. For 2.1 The basic XML processor profile and 2.2 The id XML processor profile, they will not be provided if the relevant declaration is in an unprocessed external entity, or is after the first reference to an external entity which is not processed. Items and properties for which support is implementation-defined. Processors must document whether they provide this information to applications or not. The tabulation which follows defines the information classes by enumerating their membership in terms of information items and their properties—each class contains all and only those items and properties against which its name appears below. This type of information item will not occur at all if standalone="yes"
Whenever a document is processed in conformance with one of the profiles defined above, the information made available to applications will be guaranteed to have certain properties. The relation between the profiles and information classes defined above is summarized in the illustration below (PNG,SVG), then the sub-sections which follow describe this in terms of invariants with respect to the information made available. Note: in an effort to maintain consistent relationships in the diagram, the label for the inner-most circle, around “Full Profile”, has been omitted. It should be read as if it was labeled “Perform XInclude processing”. Every instance of processing a given namespace-well-formed XML document in conformance with the same profile will make available exactly the same information with respect to the information items and properties which that profile is required to provide accurately, as tabulated above. And all the differences listed in the next two sections. Where an id processor reports an Unexpanded Entity Reference, richer ones will report the entity expansion, that is, they will report some number of information items and their associated properties. For this reason, the information reported from an id processor may differ from that reported by a processor conforming to a richer profile with respect to any or all of Element, Attribute, Character, Comment, Namespace, Processing Instruction and Unexpanded Entity Reference Information Items. With respect to [normalized value], [specified], [attribute type] and [references] where an id processor has not processed the relevant declaration, but a richer one has. And all the differences listed in the next section. Parallel to the case for expanding entity references in the previous section, XInclude processing in conformance with the full profile may replace some (XInclude) Element Information Items reported by processing in conformance to other profiles with some amount of different information, corresponding to Element, Attribute, Character, Comment, Namespace and Processing Instruction Information Items. The profiles defined here can be used as a starting point for the definition of further profiles. For example, the media type registrations for stylesheet languages applicable to XML such as application/xslt+xml or text/css might define a profile specifying appropriate <?xml-stylesheet type="[their media type]" . . .?> processing in addition to the processing required by 2.2 The id XML processor profile. Conformance to this specification means conformance by XML processors to profiles, as specified in 2 XML processor profiles. Which profile or profiles an XML processor conforms to may depend on how it is configured. The conformance conditions for any specific processor configuration with respect to each profile are specified in the corresponding sub-section of 2 XML processor profiles. Accordingly, any specification which references this one normatively is recommended to do so in terms such as "Conforming implementations must process XML documents and make information available as required by the id XML processor profile." Specifying desired information outcomes is not sufficient to completely determine XML processor behaviour. In particular, if validation is performed and errors detected, the result may be no outcome at all. A range of schema languages and approaches to validation exist. Some may provide for additional information items and/or properties which are not addressed by this specification. Also, the validation-dependent [element content whitespace] property of Character Information Items may only be reliably provided in conjunction with some approaches to validation, specifically DTD validation. 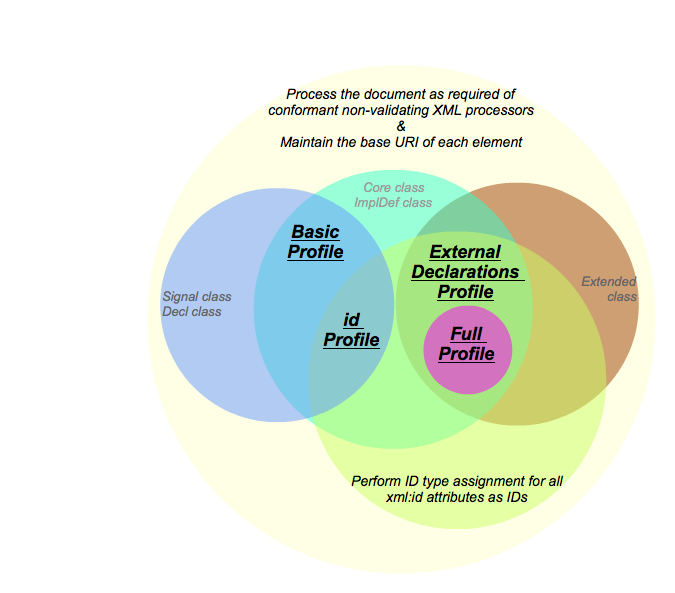 Furthermore, not all of the profiles defined above can be combined with all forms of validation: in particular, DTD validation requires that all external markup declarations be read and processed, and so cannot be required in conjunction with 2.1 The basic XML processor profile or 2.2 The id XML processor profile. Accordingly, specifications referencing this one should also specify whether validation is forbidden, optional or required, with respect to which schema language(s) with what validation control settings, if any. If the 2.4 The full XML processor profile is involved, careful consideration is required as to whether validation is to happen before XInclude processing, or after, or both. XML Information Set , World Wide Web Consortium. Most recent edition (the second) is dated 04 Feb 2004, John Cowan and Richard Tobin, Editors. The latest version is available at http://www.w3.org/TR/xml-infoset/. XProc: An XML Pipeline Language , Norman Walsh, Alex Milowski, and Henry S. Thompson, Editors. World Wide Web Consortium, 9 March 2010. This version is http://www.w3.org/TR/2010/REC-xproc-20100511/. The latest version is available at http://www.w3.org/TR/xproc/. XML Path Language (XPath) 2.0 (Second Edition) , Anders Berglund et al. Editors. World Wide Web Consortium, 14 December 2010. This version is http://www.w3.org/TR/2010/REC-xpath20-20101214/. The latest version is available at http://www.w3.org/TR/xpath20/. xml:id Version 1.0 , Norman Walsh, Daniel Veillard, and Jonathan Marsh, Editors. World Wide Web Consortium, 09 Sep 2005. This version is http://www.w3.org/TR/2005/REC-xml-id-20050909/. The latest version is available at http://www.w3.org/TR/xml-id/. XML Inclusions (XInclude) Version 1.0 (Second Edition) , David Orchard, Jonathan Marsh, and Daniel Veillard, Editors. World Wide Web Consortium, 15 Nov 2006. This version is http://www.w3.org/TR/2006/REC-xinclude-20061115/. The latest version is available at http://www.w3.org/TR/xinclude/. Extensible Markup Language (XML) 1.0 (Fifth Edition) , Tim Bray, Jean Paoli, C. M. Sperberg-McQueen, et. al., Editors. World Wide Web Consortium, 28 Nov 2008. This version is http://www.w3.org/TR/2008/REC-xml-20081126/. The latest version is available at http://www.w3.org/TR/xml/. Extensible Markup Language (XML) 1.1 (Second Edition) , Tim Bray, John Cowan, Jean Paoli, et. al., Editors. World Wide Web Consortium, 16 Aug 2006. This version is http://www.w3.org/TR/2006/REC-xml11-20060816/. The latest version is available at http://www.w3.org/TR/xml11/. Namespaces in XML 1.0 (Third Edition) , Tim Bray, Dave Hollander, Richard Tobin, and Andrew Layman, Editors. World Wide Web Consortium, 8 Dec 2009. This version is http://www.w3.org/TR/2009/REC-xml-names-20091208/. The latest version is available at http://www.w3.org/TR/xml-names/. Namespaces in XML 1.1 (Second Edition) , Tim Bray, Dave Hollander, Andrew Layman, and Richard Tobin, Editors. World Wide Web Consortium, 16 Aug 2006. This version is http://www.w3.org/TR/2006/REC-xml-names11-20060816/. The latest version is available at http://www.w3.org/TR/xml-names11/. XML Base (Second Edition) , Jonathan Marsh, Editor. World Wide Web Consortium, 28 January 2009. This version is http://www.w3.org/TR/2009/REC-xmlbase-20090128/. The latest version is available at http://www.w3.org/TR/xmlbase/. XML Path Language (XPath) Version 1.0 , James Clark and Steven DeRose, Editors. World Wide Web Consortium, 16 Nov 1999. This version is http://www.w3.org/TR/1999/REC-xpath-19991116/. The latest version is available at http://www.w3.org/TR/xpath/. XQuery 1.0 and XPath 2.0 Data Model (XDM) , Ashok Malhotra, Jonathan Marsh, Norman Walsh, et al., Editors. World Wide Web Consortium, 14 Dec 2010. This version is http://www.w3.org/TR/2010/REC-xpath-datamodel-20101214/. The latest version is available at http://www.w3.org/TR/xpath-datamodel/.